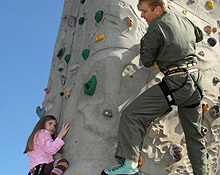 The Seattle-Tacoma area provides servicemembers and their families world-class recreational opportunities. Whether interested in catching a Mariners game at Safeco Field or camping in one of the regions many beautiful parks, there's something for everyone to do. And military-friendly areas like Sea-Tac always have discounts for servicemembers, so check with your local MWR before you go to save some money along the way.